W.W.II. 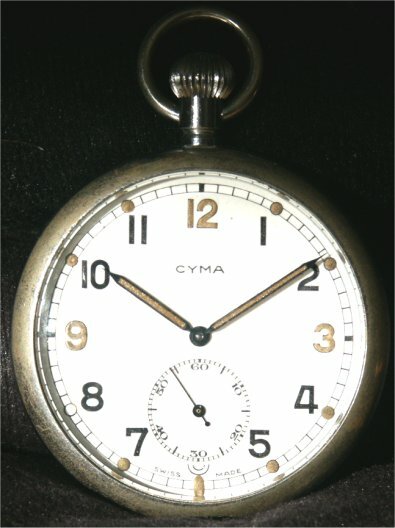 British military pocket watch made by the quality Swiss watch manufacturer CYMA around 1930 ~ 1940. Nickel plated case with snap-on back and bezel. Case diameter (not including crown) : 52 mm. Unfortunately there is considerably wear to the plating. Cream colored dial with subsidiary seconds. Black numerals, luminous hour markers, numerals (12, 3 & 9) and skeleton hands. (luminous paint faded with age). The time keeping is still very accurate. 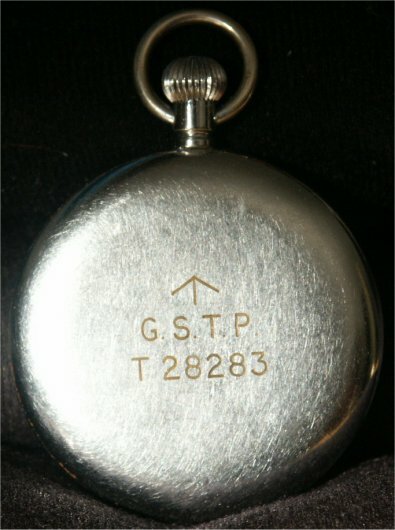 The back is engraved with the famous War Department Broad Arrow, the abbreviation G.S.T.P, meaning “General Service Temporary Pattern” and what appears to be the serial number.